Koh Chang News Update for 4 August. Garbage will cease to be a problem on Koh Chang says the Mayor. The Great Cheese Shortage. Dodgy Land for Sale on Koh Chang. Beautiful land For Sale on Koh Mak. Plus a video of a guy getting his car stuck in a flood in Kai Bae beach, Ko Chang. Last week saw the end of the problem of garbage on the island. I know this because there was a newspaper report that stated it. The elimination of piles of unsightly garbage was achieved by the issuance of a municipal ordinance to that effect by the island’s ‘Mayor’. I can see the guy’s point, when you drive along the west coast, it’s pretty easy to see the piles of garbage left by market traders, for example. The rubbish in the photo below had been sitting by the main road for a few days before I took the picture. Looks like no-one was rushing to enforce the ordinance. The last garbage disposal firm hired by the municipality for 900,000 baht a month was not ready to risk an investment to increase its capacity due to the short-term contract. A new contractor is being paid 600,000 baht a month to collect and dispose of garbage on the island. But it, too, is reluctant to invest in more modern and costly disposal equipment . . . If you can spot as to why this might be, please contact the Koh Chang Municipal Office in Dan Mai – there’s a job waiting for you. The Great Cheddar Drought of ’09: Expats on Koh Chang face many hardships. This is just another example of how tough life can be here, in this case for those of us who enjoy a little bowl of freshly cubed Gouda along with a cold beer. Signs like this are popping up all over the island and there are rumours of some people making do with Kraft Processed Cheese Slices – (109 Baht for 10) instead. The joys of schadenfreude: If you havent already noticed it, here’s a pretty funny 30 second video of a guy getting stuck in a flood on Koh Chang. 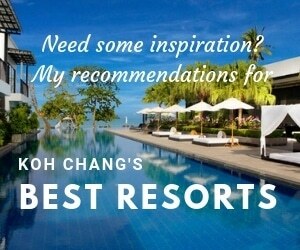 Bhumiyama Resort in Koh Chang itself is a very nice resort. Spacious room, big swimming pool. I like the food in their restaurant, particularly their fried rice. I had eaten 2 times a day and I didn’t get bored of it. The room was nice, had a bathtub inside the room. Spacious enough for 3 of us playing inside. The balcony was nice too. But we didn’t fully use it. Resort had a movie library, we rent many of them and watched in our room. By the way, the beach was nice too. But we didn’t like the salted sea water, so we didn’t really play in the sea. 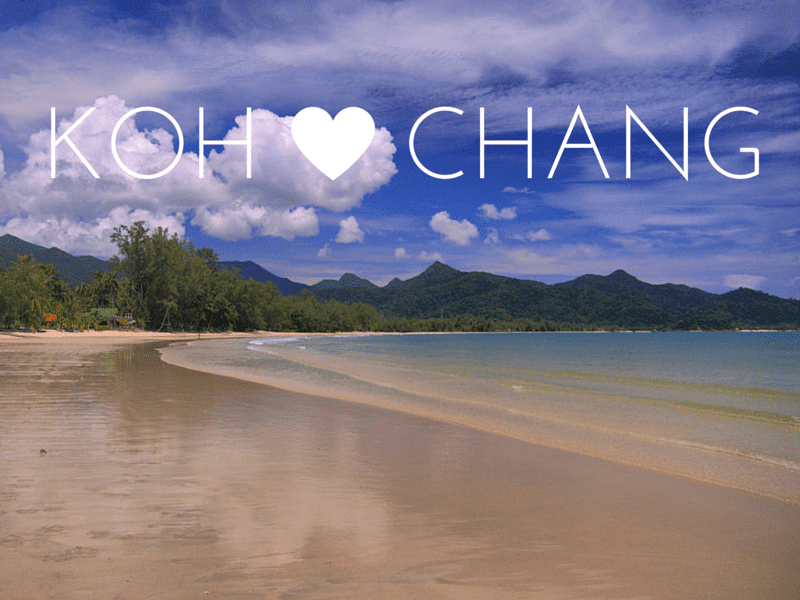 Live (adj) on Koh Mak: There’s still, as far as I know, only one webcam with a view on Koh Chang and that’s from CocoDeeBo Tours in Chai Chet. But I just found a cam on Koh Mak that broadcasts live video 24 hours a day from Palm Beach Resort on Ao Kao Beach. Looks pretty windy right now. Unintentionally Ironic Misspellings: Moving on from the sublime to not ridiculousness, but more like what passes for normal on Koh Chang . . . . You too can live at what I think might really be titled ‘Parodies Village’. If you’re interested, give ‘ Land in Thailand with usage, but not ownership rights, and which is totally impossible to legally lease longterm or own in a foreign name’ a Google first.